Guys, I'm frustrated with the internet. Having any kind 0f online presence is really hard when you have a unique name. Like, I know for a fact I am the only person on earth with my name, so anyone who Googles me (especially potential employers) can see anything I've ever done on the internet that's under my real name. Sure, LinkedIn is the first thing that comes up in search listings, but beyond that? Any public Facebook event that I've ever commented on (even though my actual profile is on lock-down). A post that one of my college professors wrote that mentions my name. My second-place ranking in an elementary-school spelling bee. My actual home address (sidenote: WHY IS THIS LEGAL?!). If it's this bad for me, I can't imagine how bad it is for people who were born in the last decade and have had everything posted online: parents posting baby pictures, Facebook accounts at age 10, digital transcripts and school newsletters. It's stuff like this that makes me want a U.S. version of the Right to be Forgotten, even if it may be abused by people with less-than-honorable intentions. 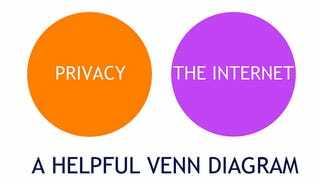 Also, here is a relevant image that came up when I searched "internet privacy." Help me move to San Francisco! I think I need to turn in my feminist card. At least temporarily.